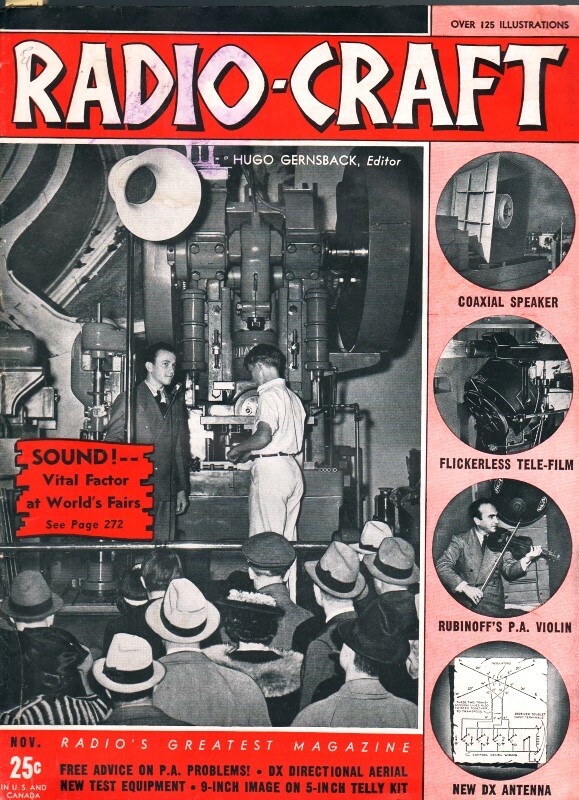 Each month, Radio-Craft magazine ran a feature titled "In Review," which covered a variety of late-breaking news topics related to communications. 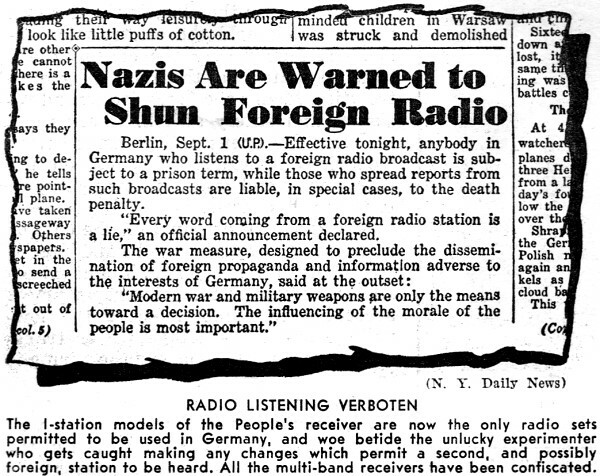 Most of the time the focus was on wireless advances, but occasionally, as in the November 1939 issue, you would see things like a huge public address & music system installation at Union Station or a flash about Nazi control over radio broadcasts. Modern news publications follow the same template with round-up type articles. The up and coming frequency modulation (FM) scheme leads here, followed by the wonders of facsimile machines that transmit "facsy" formatted news to remote offices. 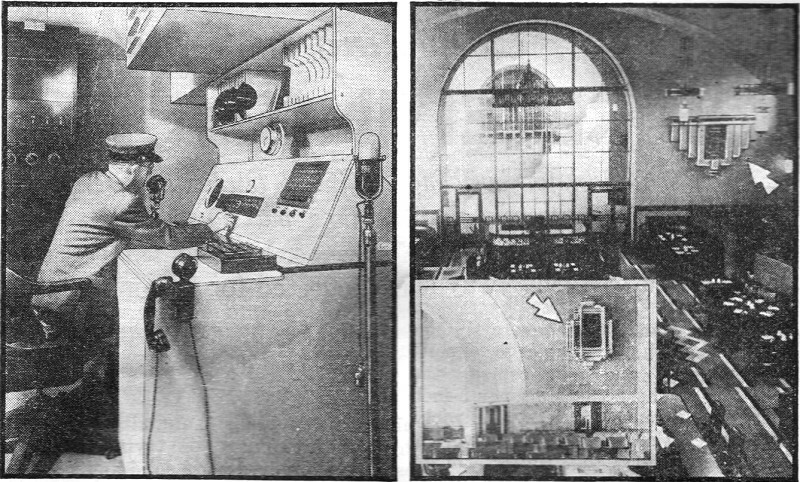 Union Passenger Terminal at Los Angeles, which cost $11,000,000, would not have been complete without its huge sound system which provides public address facilities, recorded music and radio programs for waiting passengers. Sound seeks out the passengers no matter whether they're in the ultra-modern restaurant (photo at right shows one of the decorative loudspeakers), or in the waiting room (inset photo shows the type of speakers used here). 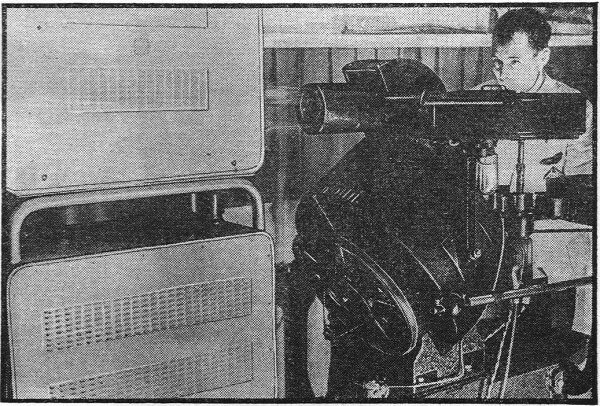 Photo at left shows part of the special control room. Extensive tests of frequency modulation are being planned by several large groups. The Bell Telephone Labs. plans, announced last month, call for comparative tests of frequency- vs. amplitude-modulated communication between aircraft and automobiles. Test stations will use 20 watts on 38.6 mc. for each of 4 portable-mobile stations, viz. : W10XJT, -U, -V, and -W.
The National Broadcasting Co. last month received permission to go on the air with 1,000 watts, on 42.6 mc., over a frequency-modulated station atop the Empire State Building. The Yankee Network, Inc., last month received the "go ahead" signal to operate station W1XOK as a relay station for high-fidelity programs from a frequency-modulated station in Boston, Mass. The relay station is to use 50 watts, on 133.03, 134.85, and 136.81 mc. The Westinghouse Elec. & Mfg. Co.'s station W8XKA, Springfield, Mass., will shortly be on the air with a 1 kw. frequency-modulated transmitter on 42.6 mc. A special facsimile edition of The Dallas Morning News will be published as soon as the new RCA equipment is installed in station W5XD, the ultra-H.F. station which is associated with WFAA. The "facsy" programs will go out on 25.25 mc., with a power of 1,000 watts. 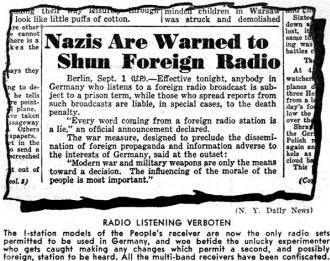 Other newspaper-owned stations in the U.S. now transmitting facsy material with similar RCA equipment are: WBNS, Columbus, Ohio; KSD, St. Louis, Mo. ; WBEN, Buffalo, N.Y.; KMJ, Fresno, Calif.; and KFBK, Sacramento, Calif. The 3-day Army war games scheduled last month to take place at Plattsburg, N.Y., were to be recorded by station WMCA. After being used as the basis of a broadcast the discs were to be turned over to the U.S. Army for use in military instruction and as a permanent record of the maneuvers. Recorders mounted in special cars, for ranging over the 25-mile front, were to operate from special studios. President Roosevelt, during his 10 days onboard the U.S.S. Tuscaloosa, each morning when he arose was handed a Finch facsimile record of material sent out the previous night, it was reported last month. These programs were received from WOR, which transmits via the RCA system Tuesdays, Wednesdays, and Thursdays, and with the Finch system on the remaining two days. Sorry we are giving you lots of trouble," Japs announced, last month, over a P.A. system erected before their sentry posts and aimed at British defenders of the foreign settlement in Tsientsin, China. According to reports, last month, the N.B.C. telly transmitter atop the Empire State Building interfered with the orchestra sound-system of the Hotel McAlpin a couple blocks away. It seems that the hotel amplifier detected and amplified the sound portion of the telly program which thus mixed with the P.A. program, both being heard at the same time by the hotel guests. Here's a good talking point for the Serviceman who wants to sell sound to his local church: "If it's good enough for the Cathedral of St. John the Divine and St. Patrick's Cathedral in N.Y.C., it must be good enough for any church."